About a month and a half ago, I woke up one morning to find a white splotch on the skin by the collar bone. I touched it — didn’t feel rough or itchy. I shrugged it off, thinking perhaps I had accidentally put a streak of sunscreen on that particular spot. After all, I had just spent two months lounging in the wonderful Caribbean heat, not to mention the previous three months spent in Koh Samui. After three years cooped up in an office, I had just spent a full five months baking in the sun. Then over the past few weeks, here in Bangkok, I started to notice a few more white spots. Then a few more. On my shoulders. A few on my back. I decided to go see a skin doctor. Luckily for me, hospitals here in Thailand — wait, let me rephrase that: private hospitals in Thailand are astounding. I chose the Bumrungrad Hospital because of its skin specialists. I walked in off the street and my jaw dropped. It looked more like a five-star hotel than a medical centers. Chandelliers and Starbucks coffee shops in the lobby. Doctors, nurses and receptionists who speak a dozen languages. Within twenty minutes of arriving at this medical heaven, I was sitting in the doctor’s office. Talk about efficient! He took a close look at my skin, and gave me a smile. He held out his arm and compared it to me, his pale Chinese skin looking like porcelain next to my toffee brown tan. He asked me how much time I spend in the sun so I told. He shook his head. Many Thai people are very protective of their skin, and for a variety of reasons, but to put it simply, the most common reason is that if you have nice pale skin it shows you don’t work all day in the rice fields like a peasant. Anyways, he told me to cover up, wear long sleeves if I have to go walk around outside in the sun, and put on sunblock every day before going out. I didn’t like the sound of that. Did he not realise the 37’C heat outside requires cute strappy dresses, not long sleeves? Even worse — how would I survive when we moved to Dubai, where the summer heat pushes 50’C? I walked out of the hospital with a little medicine bag in hand, and cringed when the bright sun hit my skin. The doctor said if I kept tanning, I would get darker, but the white spots would stay white. That’s not what I wanted. Being a Trini, I think I am born to bask in the sun. Now that would have to change. Bumrungrad Hospital is located on a street called Nana Nua, also known as Arab Street. It is home to a small Middle Eastern community, with lots of restaurants, halal food stores and shisha cafes. I looked around at the women walking around me, covered from head to toe in black hijabs and chadors, and the men in long billowing robes. That’s when a light went off in my head. If they could do it, surely I could find some kind of clothing to cover my skin while still staying cool. So, the next day, I headed off to Chinatown. Now, that might sound like a strange statement — what the hell does protecting my skin have to do with Chinatown? Well not too long ago I read in my guide book that Chinatown also has a section which is a Little India, called Pahurat. With map in hand, I set out to find it and try to find some clothing that would protect my skin while also keeping me cool in the heat. 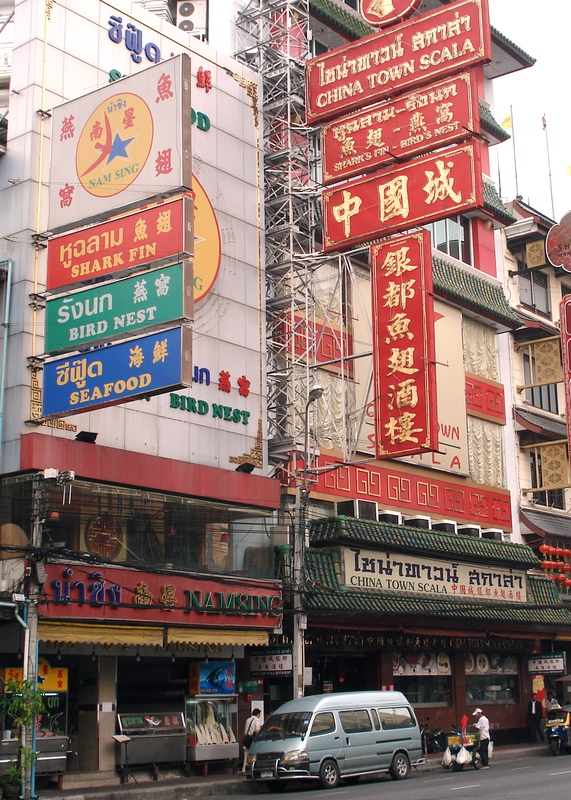 Unfortunately, Chinatown is way on the west side of the city, and it’s not connected by Bangkok’s wonderful train system. So I took the Sky Train over to National Stadium station, went down to the street, and with map in hand tried to catch a ride. First I hailed a taxi. 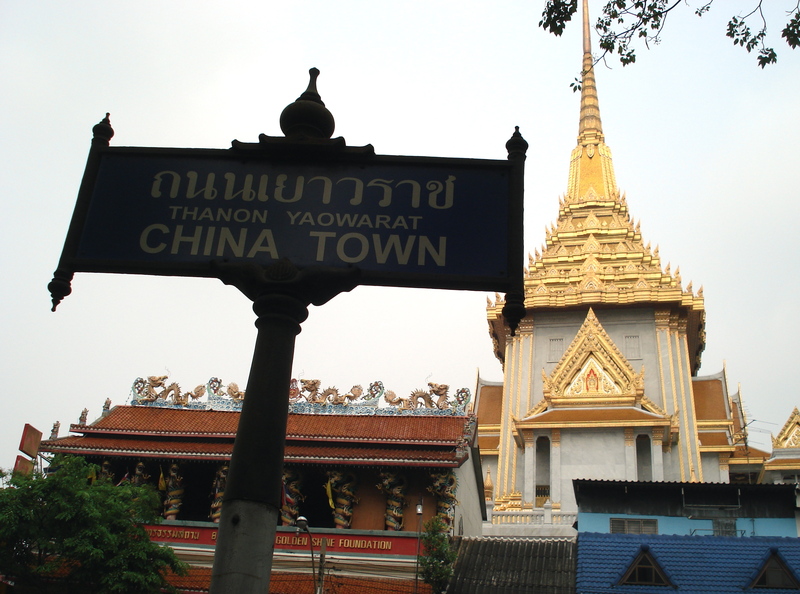 “You go to Yaowarat?” I asked, using the local Thai name of the main street in Chinatown. He sucked his teeth and shook his head vehemently. “No no no!” he said. I shrugged and closed the door of the taxi as he drove off shaking his head. But why? Why would any taxi driver refuse to take a customer somewhere? Who would turn down a paying job? Perplexed, I walked a bit more down the road and decided to try my luck with a tuk-tuk. Now, what’s a tuk-tuk, you may be asking? It’s not quite a car, it’s not quite a taxi. It’s a tuk-tuk. It’s SUPPOSED to be cheaper than a taxi because it isn’t air-conditioned. So the tuk-tuk driver says okay, he will take me to Yaowarat, but because tuk-tuks don’t have a meter, he wants to charge 80 baht. “It’s very far,” he says. I shrug and climb in. It’s hot, it’s less than US $3, and I don’t feel like looking around more for transport. Whatever. My self-guided walk through Chinatown actually began at the top of Yaowarat Road under a large red gate which marks the beginning of the Chinatown district. All along Yaowarat are Chinese restaurants, including dozens and dozens of shark fin soup places, far more than I ever saw in Hong Kong. I pass stalls and corner shops selling baskets full of all kinds of weird herbs and roots and spices and shoots I could not even begin to identify. Chinatown really is a totally different world in Bangkok. After walking for about 20 minutes or so, and trying my best to follow the map and not get licked down by oncoming buses, motorbikes and tuk-tuks, I finally reached to my destination, the intersection of Yaowarat and Pahurat. I stopped and looked around to try to figure out where to go. Just then two little Thai kids in school uniform walked past, and the little boy looked up at me with a big smile and said, “21!” The little girl next to him giggled. “22!” she yelled out in glee. “23!” I replied to them. They burst out laughing and ran away, shouting “24! 25! 26!” Obviously they had just had English class that day… wonder what they studied? Pahurat Market was full of tiny stalls under huge tents, and little alleys chock-a-block with shops selling a lot of beautiful Indian and Middle Eastern clothes. I picked up a few long sleeved blouses and kept looking around. Much to my amazement, I realised that a lot of stores in Pahurat carried ‘plus sized’ clothing; sizes which would be average in North America, but are huge for tiny Thai girls. That’s when I realised that I had stumbled onto a goldmine. It is really hard for a full-figured woman like me to find clothes in Asia because the locals are so small in comparison. But in Pahurat, they carry clothes specifically for Indian and Middle Eastern women. And everyone knows — no offense intended — that a lot of Indian women start off life small and later end up plump after a lifetime of a diet heavy in carbs and sugar and oil, while Middle Eastern women in general are not exactly gym-goers for cultural reasons. Finally, an area in Asia where clothes fit my backside… it’s a miracle! I bought a pair of pants immediately just in case I was imagining things. Pahurat apparently closes quite early, between 4.30 and 5 pm, so if you are going there for shopping, don’t expect the shops to be open well into the night. And if you can, try to avoid the traffic heading into the city during rush hour. FYI, I’ve learnt the tuk-tuks actually rip you off. 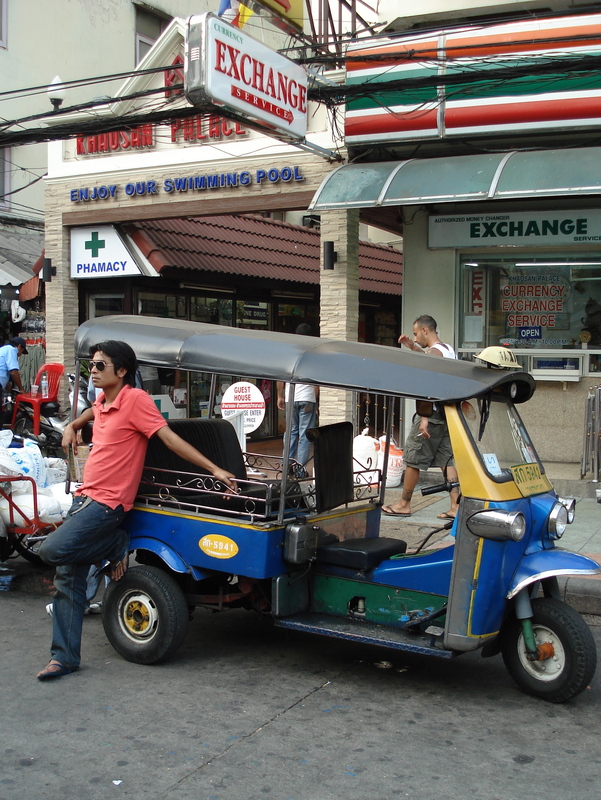 The tuk-tuk had charged me 80 THB to get there, while the nice air-conditioned taxi barely cost 60 THB. Ah well. We all live and learn….. I know now where you’ll be going for dinner, or lunch, when S gets back. You found more food…plus great you could find some long sleeved clothes. I wondered if they were light in weight? What type of sun block are you able to get there? So fun to read about your adventures.